Fresh efforts are being made to protect Cumbria's red squirrel population. Native UK red squirrels are under threat from a virus which is spread from grey squirrels, introduced at the turn of the 20th Century. Dwindling populations of the animals survive in several parts of the north of England, including Cumbria. Now the Save Our Squirrels (SOS) project in the county is to fund a squirrel control officer, who will be able to shoot and trap grey squirrels. The project is part-funded by the Heritage Lottery Fund. 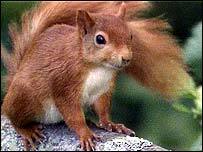 About 140,000 red squirrels remain in the UK, compared with more than two million grey squirrels. A spokesman for SOS said: "The grey squirrel control officer's activities will support conservation work taking place in the greater Kielder and Spadeadam forest complex, through monitoring and trapping on key incursion corridors."